To find a divergence, first see which way the market is trading. In the chart below, price is making a series of lower lows and lower highs denoting a downtrend. The indicator, however, is not making lower lows; it has made a higher low. As you can see in the chart, a divergence has taken place between the price action and the indicator. The price has made lower lows, but the MACD histogram has made higher lows. Soon after, the downtrend starts to reverse to the upside. It takes practice to spot a divergence. 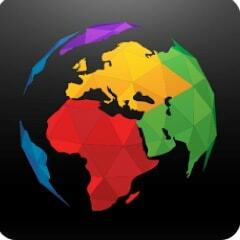 However, once you are accustomed to finding them, they can be a useful tool to spot upcoming trend changes. The higher the time frame, the longer it may take for the trend reversal to actually happen. Divergence can be used on a lower time frame, but it pays to be a little more cautious. Sometimes by the time you spot a divergence on a lower time frame, the reversal may have already happened. 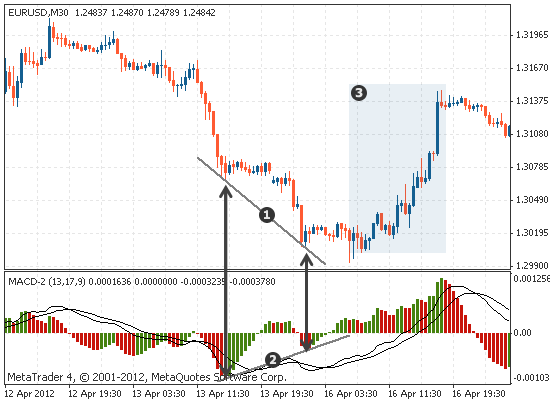 Which indicators can be used to find divergence? 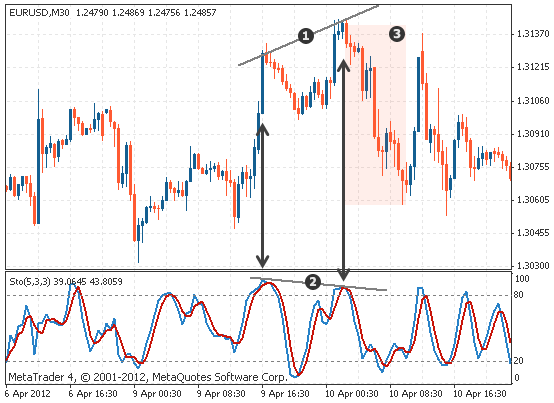 Common indicators are the stochastic indicator, the MACD and the OsMA. However, almost all indicators can be used to find divergence. 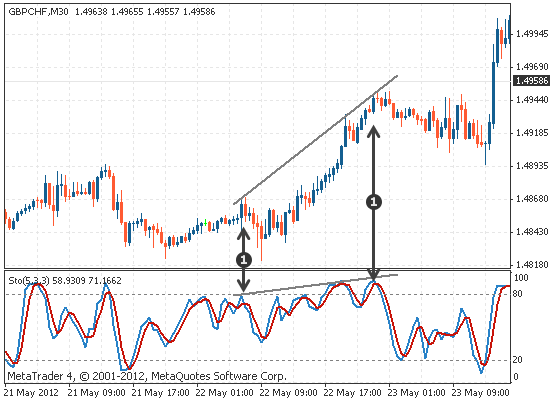 The chart below shows an example of divergence being spotted using the stochastic indicator. The chart below shows an example of divergence being spotted using the OsMA indicator. There are a number of ways you can use divergence for trading. However, you should remember that divergence is a concept that should be used in conjunction with a strategy. That means you still need to define your entry point, your stop loss and your profit target. Divergence can be helpful in preparing you to get into a new trend direction early on. A bearish divergence is shown by a higher high on the price chart, a lower high on the indicator, and is typically used to look for short trades. A bullish divergence is shown by a lower low on the price chart, higher low on the indicator, and is typically used to find long trades. The following table gives you an overview of what kind of divergence is taking place, the behaviour of the price action and indicator, and what kind of a trade you should look for. 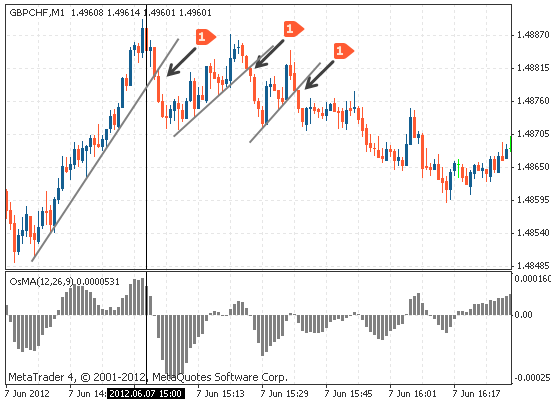 Below are a few examples of how you can apply divergence in your trading decisions. Using a trend line as shown in the chart below, you can find an entry by first finding a divergence and then entering into a position once the price action breaks the trend line. This can be used in conjunction with multiple time frame analysis or on a single time frame. 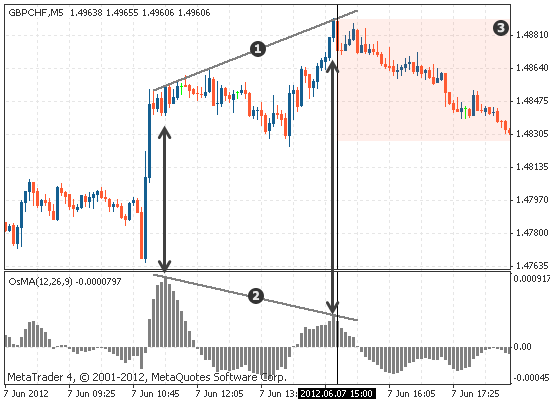 Divergence can be combined with multiple time frame analysis. If you are using a higher time frame to identify the direction, then a divergence can help you find a change in the overall trend. It is then possible to go to a lower time frame and find an entry using a specific method, such as a trend line breakout. In the chart below, a higher time frame is used to determine the market direction; the indicator shows a divergence, thus indicating a price reversal. You can then move to a lower time frame to find possible entries, as shown in the chart below. ... divergence is a way of identifying a possible change in market direction ahead of time. 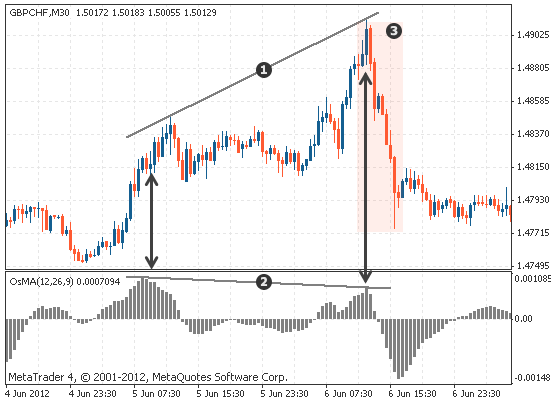 ... it can be a powerful tool to enter into a counter-trend trade. ... there are two types of divergence: bearish, shown as higher highs on the price chart and lower highs on the indicator; and bullish, shown as lower lows on the price chart and higher lows on the indicator. ... on a higher time frame it may take longer for the reversal to happen. ... the higher the time frame, the more reliable the signal is. 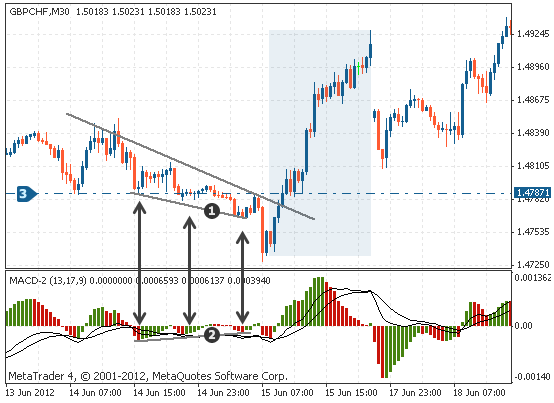 ... to find entries, divergence can be combined with multiple time frame analysis or a trend line break.